Throughout the first half of the 2018 season, the Terps have unified around a common pastime: popular survival-based video game Fort Nite: Battle Royale. So, it was only fitting that on the evening of the “Fort Night” promotion at Bob “Turtle” Smith Stadium, Maryland broke out for seven runs on eleven hits in a 7-1 victory over Illinois in the nightcap of Friday’s doubleheader. Left-hander Tyler Blohm tossed 6.1 innings of one-run ball while Morris and Kevin Biondic each collected a homer and two doubles as the Terps (15-16, 3-2 Big Ten) evened the series at a game apiece. John Murphy tossed 2.2 scoreless innings at the back end to pick up his third save of the year. Held in check by Illinois starter Andy Fisher in game one, the Terps’ offense broke out early against Ryan Schmitt in the nightcap. They opened the second inning with three straight hits – a Kevin Biondic double and singles by Zach Jancarski and Taylor Wright – to get on the board. After a pair of strikeouts, Justin Morris hit a three-run shot off the light pole beyond the right-field fence to extend the Maryland advantage to 4-0. An inning later, Biondic – who just missed a home run his first time up – hit a solo shot over the left field wall by the scoreboard, his fourth home run of the year. Meanwhile, Blohm returned to the dominant form he displayed two weeks prior against Stetson. The southpaw shut down an explosive Illinois offense, scattering five hits while whiffing nine hitters. He struck out Illini slugger Bren Spillane – who entered the contest with a cool .489/.571/.1.120 slash line in 25 games – three times, making the three-time Big Ten Player of the Week look utterly lost at the dish. Blohm’s only blemish on the night came in the seventh inning. He surrendered a one-out walk in front of Jeff Korte’s double, which put men on second and third. That spelled the end of the night for the sophomore starter, who exited in favor of John Murphy. Grant Van Scoy then drove in a run on a ground ball to second, ending the shutout, but Murphy froze Zac Taylor to shut the door. His counterpart, Schmitt, did not fare as well on the hill in his first career start. The sophomore right-hander lasted just 3.2 innings, surrendering six runs on eight hits. He departed in the fourth, after issuing his first free pass of the night to Terps shortstop AJ Lee. Earlier in the frame, a Chris Alleyne single and a Morris double set up Nick Dunn’s sac fly that drove in the Terps’ sixth tally. Sean Leland replaced Schmitt and stifled the Maryland offense for three innings before the Terps struck again in the eighth inning to make it 7-1. Morris reached on a hit by pitch and moved to third on Dunn’s single before Marty Costes drove him in on a groundout. Murphy made things interesting in the ninth, hitting two consecutive hitters on two-strike counts to put a pair of men on with one away, but struck out Van Scoy and Taylor to seal the victory. Friday night’s victory came in the nightcap after Illinois dominated the Terps in the first game, 10-6. 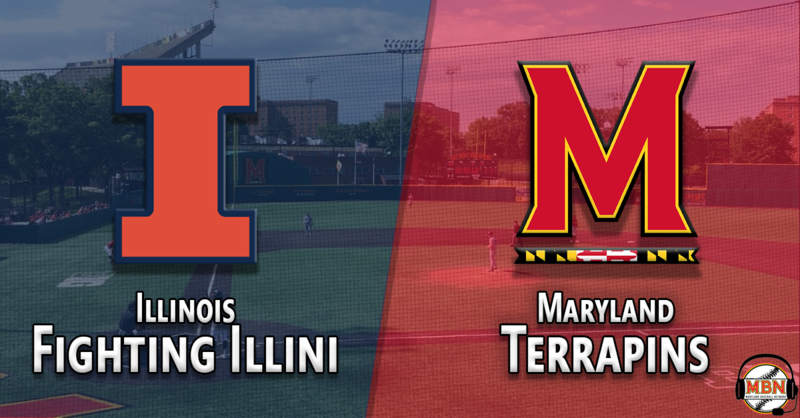 After a day off Saturday, the Terps will look to take their third straight series (and second straight Big Ten series) Sunday at 1 p.m. Hunter Parsons (3-2, 3.33 ERA) takes the hill for Maryland against Ty Weber (3-1, 2.74 ERA) for Illinois.